El Grande , Wolfgang Kramer and Richard Ulrich, Hans im Glück, 1996. 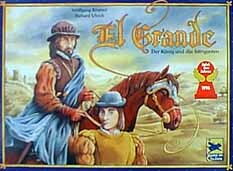 El Grande is a fascinating place-and-score game with two card sets for taking turns and performing actions. Set in 15th century Spain, each of the 5 players place their caballeros in 9 regions hoping to score points for the final victory. There are many original and imaginative ideas which work together well for a thought-provoking 2 hours of gaming. The board is a beautiful map of old Spain with each of the 9 regions cleary marked with its name and point values. Points are awarded for first, second, and third plurality of caballeros in each region. Caballeros are represented by wooden blocks which move in two stages: first from the provinces (out of play area) to your court (in front of you, ready to play area) and then from the court to the regions on the board. Points are awarded every 3rd round, with victory going to the highest scorer at the end of nine rounds. One of the key new ideas to this game is the two related power and action card decks. Each player has an identical deck of 13 power cards numbered 1 to 13. Each turn a player bids for the turn order by playing a high numbered power card to move first or a low numbered power card to move last. Once each player has bid a power card for the turn order, it is out-of-play for the rest of the game. An interesting twist is that the high numbered cards allow you to move fewer pieces and the lower numbered cards allow more pieces from the provinces to the court, so you are constantly at odds over when to move and how much you may move. For example, the 13 card allows you to move first, but with it you cannot move any caballeros. On the other hand, the 1 card forces you to move last, but you can get 6 fighting cabs from the provinces to your court ready to deploy and do battle on the board. The turn is executed with the highest power player going first. The player gets to choose one of five available action cards, then playing and discarding the card. Each of the action cards allows you to move from 1 to 5 caballeros from your court to the board and perform an optional action. The actions generally shuffle piece around the board or score certain areas or bend the rules in other ways. It is essential in this game to play early enough in the turn to select a good action card, but late enough in a turn to move more cabs around. There you have the basic gist of the game, but there are plenty of other twists. For one, there is the king who affects placement of caballeros in his and adjacent regions. First, the king completely freezes movement of caballeros in his region. Second, caballeros are only allowed to deploy in regions adjacent to the king. So action card number 5, which is always available and allows you to move the king around the board, is used to lock or unlock certain reqions for battle. Once favorite move for powerful grandes is to tuck the king in a corner, and prevent caballeros from deploying in hotly contested regions. A second interesting set of rules involves the Castillo. The Castillo is a region with a beautiful, hollow, wooden tower. Players deploy caballeros into the tower which remain hidden from view until scoring time. 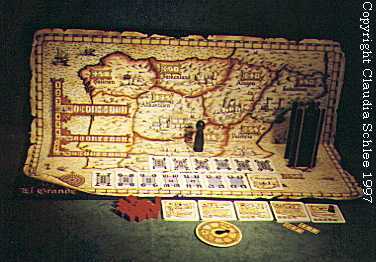 After the caballeros in the tower are scored, they get to redeploy onto any other single region on the board using the secret voting wheels. Effectively, these caballeros are scored twice and peform the task of reinforcing ailing regions. Since everyone's vote is a secret, it is often a nerve-wracking exercise to out-guess your opponents. One general rule of strategy is get your caballeros out on the board where they can score points. I've seen many players fight for the first move, diddle with the placement of the king, yet have very few caballeros out on the board. When scoring rounds came, these players were left in the dust. On the other hand, I've gone through many games without playing my higher cards, but I've often swamped the other players with an outstanding quantity of cabs. Extra cabs on the board will never hurt you. Another consideration and strategy for this game is similar to other games such as Manhattan : don't appear to be in the lead. With such a clearly visible score track running around the board, the most natural move is to attack the leader. Give some consideration to making you killer moves later in the game. There is some cajoling and diplomacy possible in the game: "Look at Linda, she is leading. Why don't you attack her." With such Machiavellian strategies, a come-from-behind victory is quite possible in this game. Although the components and artwork are very good quality, one problem with the game is the action card deck. The original German deck is a problem for non-German speakers, and a translation sheet often slows down the game as players attempt to find definitions to cards of similar but different text. Rio Grande Games has offered an English action card deck, but the cards are small, squish the artwork aspect ratio, and force all players to squint and hunch over the board to read the text. The best solution is to make your own action card set using a computer, laser printer, scanner, and imaging software. First, scan the artwork from the German cards. Second, grab the English card translations from the Game Cabinet or one of the other sources. Third, do a bit of image editing and remove the German text from the cards and overlay the English text in a similar font. Print the new artwork on high quality laser printer paper. I also suggest that these prints be made 2 or 3 times the original size for easy reading from across the gaming table. Finally cut and glue these prints to card stock using spray adhesive available at any art supply store. Viola, easy to see, easy to see, and your gaming friends will love you for it. I'd like to make my proofs available on the internet, but it would infringe on the copyrights of the original game makers, so don't ask. Despite these glitches, its an excellent game, and it deservedly won the "Speil des Jahres" award in 1996. As of 1997, an expansion set Konig & Intrigant , replaces the power and action cards with a new set of power/action cards and is a bargain at $15. And in 1998, a second expansion Grossinquisitor & Kolonien adds France and the New World as territories and other more detailed rules. Kramer and Ulrich also created El Caballero , a related game using a similar power card set, released at Essen in 1998. I'll review these games once I've had enough plays under my belt. This game is more complex than many other German games, and it provides lots of choices and agonizing tactical decisions. I cannot begin to say how nervous I've been on that last turn when I knew my score was close to winning. For anyone who likes the elements of biding, placing, and scoring, this is an excellent game. Highly recommended.